Majority of Ambassadors works areas fall under tribal concentrated belts. We felt that Tribal population in this region have been most neglected and exploited and accordingly we wanted substantial changes in their social and economic scenarios. 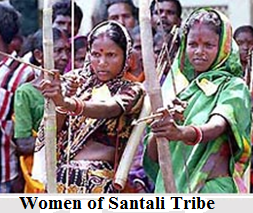 Of special concern was the position of tribal women who were facing serious problems within their families and outside. We found several women headed households due to either desertion by husbands, or divorces or death of spouses. 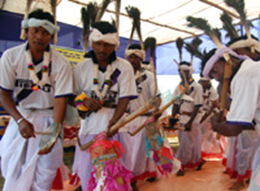 Lodhas, Santals are major tribals groups, the others being Lerka/Hoi, Bhumij, Kurmi, Mahali, Munda & Kora. 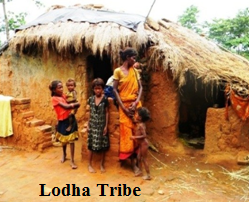 Lodha Tribe is a Primitive Tribal Group, concentrations are found almost in 354 villages. They may be called as a hunting class. They even collect fruits, honey etc. from the forest. They become habituated with agriculture as deforestation caused demolition in their livelihood. Acute poverty and poor living conditions are common. Chang dance is held during festivals & marriages. "Changu" is made from Karat tree. Due to rapid urban influences these traditional cultures and crafts are getting subdued. 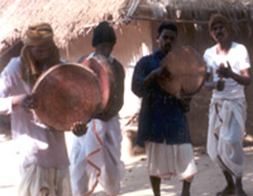 Our NGO is attempting to preserve the tribals’ cultures, their traditional crafts at the same time helping them to enjoy a better quality of life. We have conducted training for tribal leaders and volunteers (covering 210 persons selected from 30 villages). These leaders were trained on various basic topics of the importance of united families, various schemes / facilities given by Government Agencies, democratic decentralization and how genuine grass-root leaderships especially among women should be encouraged, the need for revamping PRI institutions to deliver goods and services to the common population channelizing all the govt. schemes. Separate training programmes were conducted for tribal women and men. Our training yielded grass-root level results. The local populations were organized into youth clubs, women’s associations and village development committees. These organizations were enabled to handle people’s issues. 200 rural youth and folk artists were engaged in this process of social awakening and collective action. The local tribal forums initiated collective actions around various social issues such as lack of basic amenities, dwindling livelihoods, poor health facilities etc. Two tribal marches were organized to submit memorandum in two Blocks to BDOs. Gender issues got highlighted and women’s increased their role in tribal community development. Men’s dominance and control over women have come down in our operational areas. Men are allowing women space and encouraging them in various activities like SHGs. Marked decrease in women’s drudgeries has been noticed with more basic amenities made available such as safe drinking water, regular health check-ups and treatment, more inclusion of their children in schools and better roads etc. Social evils like dowry, child marriages and violence against women are coming down. Protection of forests and the need to acquire literacy skills too were highlighted in this process.